Digital Transformation Means Brands Need to Market Better – Using Create Your Own Tools is a Start! As digital technologies continue to evolve and transform so do the opportunities for brands to offer more tailored and creative marketing solutions. But only now are brands helping customers to create their own products. Nike ID and Building Your Own Tools. I think I was around 15 years old when the Nike ID tool was first released. It was 2006 and the online tool was exclusive to the Nike website, letting you create your own football, soccer, or running footwear based on a limited number of colors, soles depending on surfaces and the opportunity to add your own embroidered initials to make you really stand out from the crowd. 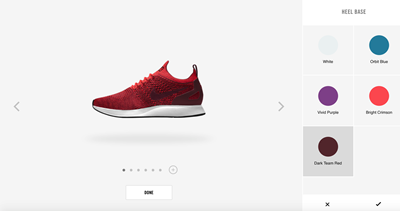 Now, in 2018, much has changed for the Nike ID store which now has an AR functionality that lets you project styles onto physical shoes using the new Nike ID AR app. As expected, Nike has always set the bar with marketing campaigns, product innovation and technology, and that’s great, but why has it taken so long for other brands to innovate, market on a more granular level and offer similar functionalities to customers who are focused on a time of individuality rather than similarity? The Cost of ‘Build Your Own’ Tools Both Financially and Physically. The truth is, functional development still costs a lot, especially for smaller brands. Thanks to the internet, eCommerce has drastically changed. Agile and fluid content management systems that are easy to use and offer a smooth UX has created a community of ‘fashion designers’ who have big dreams, with small budgets. These one-man bands or small businesses have been given the opportunity to build their clothing or fashion accessory line at scale, and with a relatively low-budget. However, there’s a catch; that lives little financially for big marketing and advertising campaigns and solutions. This, in turn, leaves the development of digital solutions such as ‘Build Your Own’ tools as an afterthought, or frankly, a never thought. Any budget left for these smaller companies is left for traditional advertising and marketing campaigns, leaving the opportunity to offer something different, like the control of creating your own product in the shadows for only the big brands to play with. An example of this are Ralph Lauren, Vans, Converse and Adidas; like Nike, these brands have both the identity and budget to offer digital solutions that put the customer at the front of the design stage of the product, keeping them exposed to the product style, materials and coloring; presenting them with the opportunity to be ‘fashion designers’ for their favorite brands, all from the comfort of their sofa. A unique proposition, and one that not all small to SME level brands can over their customers. That can’t always be said for every small brand now however. More and more SMEs are taking a look at digital tools that offer a more personalized and catered for experience to their customer base. 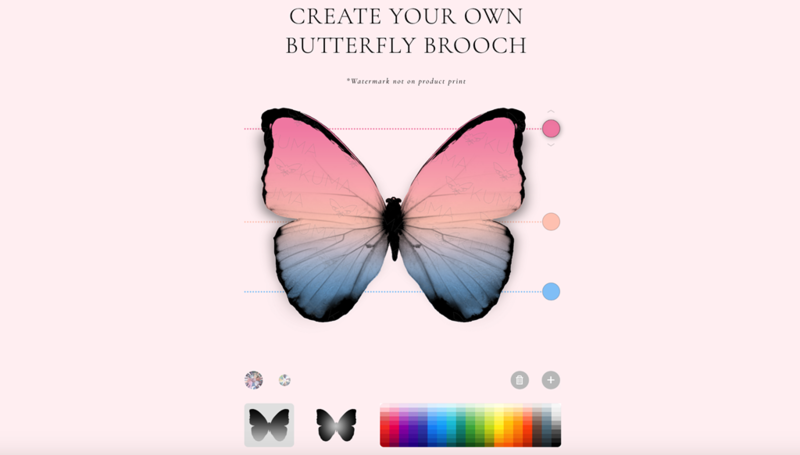 An example of this would be Kuma Design and their ‘Build Your Own Butterfly’ tool. This tool offers customers the opportunity to feel totally unique, allowing customers to choose their own color, add Swarovski gems and pick design styles, giving majority control to the designing of your perfect handmade brooch. Personalized fashion isn’t just for big brands anymore; Daniel Wellington offers the opportunity to match watch straps with faces, and whilst this isn’t a ‘create your own’ solution, it does allow you the scope to buy a watch with the face and strap of your choosing. Furthermore, more brands at all scales are using fashion personalization tools as a key driver in improving customer retention and happiness. 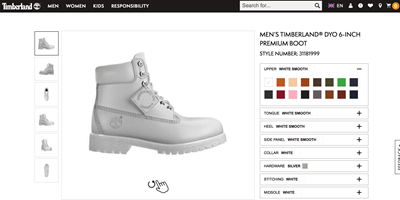 This isn’t necessarily ‘build your own’ tools, but enhanced search functionalities that allow you to search more granularly for a perfect fitting product, in a color and style you’re looking for. Additionally, with the introduction of product aggregators like ‘Love The Sales’, the need for a more detailed and personalized product search functionality is now a ‘must’ for brands to help provide a ‘industry standard’ search solution for customers. Now, more than ever, is the time for brands of all scales to offer more than just a ‘website’, and introduce AR, VR, and customization technologies in order to help enhance their customer experience at all touchpoints, improve retention and drive new customers as a result of digital solutions that tailor to customer needs and not ‘profitability’ first.